Black H&amp;M knit cropped sweater, Gold/black c/o Foxy Originals Estate necklace, Dark blue American Apparel shorts, Brown c/o Hobo International Candis crossbody bag, Silver H&amp;M cuff, Gold F21 rings, Black Urban Outfitters boots. Wanted to share with you three new additions to my closet I'm addicted to at the moment -- firstly two I got at H&amp;M that embody edgy and tough, a style I'm leaning more towards nowadays. I got this cropped knit sweater that has this shine to it that makes it look like leather and I found this pretty silver cuff. Lastly, I received this beautiful necklace from Foxy Originals which reminded me so much of the House of Harlow one! Except the price is so much better for my wallet and I love it more because it's almost like a choker necklace, something I've been coveting for a while. Paired off the outfit with colors I haven't experimented with in a while, black and blue combo..maybe reminiscent of Backstreet Boys Album? haha. Loving everything 90's at the moment. Last week I modeled for a ModCloth photoshoot, which I'm super excited to show you all! I will definitely let you know once it's up on their site :). And this week, am modeling for another shoot with indiDenim! Can't wait to share it with you as well! :) Other exciting things happening, just started a new job at Urban Outfitters and loving it! Favorite trend there right now is 90's Grunge Romance..I'm addicted. Awesome outfit, and omg those photoshoots sound sooooo fun!! So lucky!! love your shorts and boots!! Oooh, loving the edgy side of Kathleen! You look like a rockstar, girl! Can't wait to see pictures from the photo shoots. I guess H&M came out with a black version to their silver knit sweater from this past Spr/Summer :) awesome! keep it up you stylish minx! those shoes are bomb btw. kill it at the shoot and have mucho fun! And congrats on your new job! that top is really cool! love the combo of blue and black, awesome necklace too my dear!! stunning as always and very inspirational. love this whole look! love everything about it! my first thought was that you got the house of harlow necklace! this is such a great alternative! love the sheen on the sweater as well! Another perfect outfit!! That necklace is amazing... and LOVE your shoes!! Love that jumper!!! You look gorgeous!! There is nothing I love more than a great pair of boots with shorts. You look adorable girlfriend! You look AMAZING here! I am so so in love with this sweater!! It's so edgy & fun! And that necklace is gorgeous, and pairs perfectly with this outfit! Love it! I'm following you now through bloglovin'! Such a unique sweater. Looks like it has some sheen to it. Interesting! Love it, gorgeous n chic!!! Awesome necklace! Congrats for all your new projects ! Your outfit is really great ! I love your necklace and sweater ! You look beautiful Kathleen ! Gorgeous, Kathleen! as always, dear! Congrats on modeling for modcloth! soo cool! this outfit is super edgy and way cool! I love your shorts & necklace & sweater. oh, hun You look so fabulous, love this edgy look. Your bun looks so wonderful.I love it! The necklace is so super stylish and is perfect touch to this look. Saw that same sweater yesterday, so want it! It looks great on you and your necklace is unique! looking good!! love your boots!!! LOVE the jumper and colour combination! Gorgous, gorgous, gorgous! Stunning outfit. I'm in love with it. I love this top! I have a similar silver one from H&M also. Your top in the previous post is beautiful also. I love love love all of it! this is my first time on ur blog. and I love it already. My first time reading your blog. Great necklace. I have the same one! What a fierce outfit!! Yess the 90s<3, i am loving your slick sweater and those edgy boots! Wow, congrats on all your gigs, you deserve it! And that is very exciting that you're working at Urban now, i love Urban soo much it's a little ridiculous. I'm bummed we didn't get to hang this summer, we should definitely pick a weekend to meet up, me, you, &Nat! I love this look, each accessory you chose was perfect, really like the necklace and cuff! This sweater is sick, I love it! Perfect outfit/colour combo! 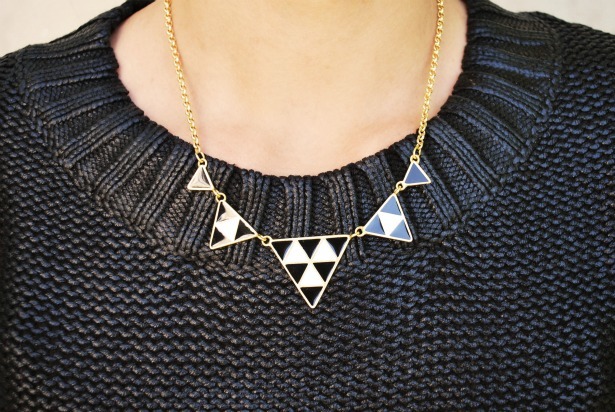 Beautiful sweater and necklace! Great casual outfit with the perfect amount of flair. Great outfit and what a cute necklace!! Also, I am inviting you to my blog it's about fashion Im sure you'll love. Check it out, I will follow back in case you do follow. 2 Giveaways going on right now! I actually had such a hard time deciding whether I wanted this sweater or not! haha. I really liked it but since it's not really my style, I decided to pass. But seeing it again, it actually (still) looks super pretty so I might get it next time to go to H&m! :) nice blog btw, will be following! just found your blog and i really like it. In thisp ost i especially like the necklace. it is so pretty. the necklace is pretty cool looking! looking forward to seeing pix from your modcloth photoshoot. I bet it look awesome! LOVe the sheen of that sweater! loving your style. its really similar to mine. follow each other? let me know. I really love your style, you are su cute! Thanks for writing this blog. it's great blog.